20-Nov-2018 -- I spent three days on vacation in Niue - the world’s second least-populous nation. 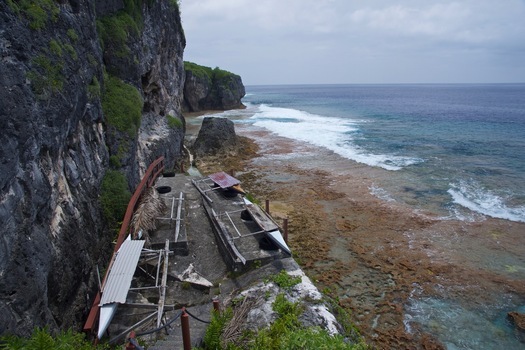 (Niue’s population is only about 1,700; only the Vatican City has fewer people.) Niue is a large coral island in the tropical South Pacific. Unfortunately there’s no Degree Confluence Point on the island itself; however this point lies off its west coast - almost 9 km away. I would have liked to have flown my drone out to the point, but an 18 km round-trip flight was probably beyond its capability. I did, however, fly my drone 3 km out into the ocean, to get a view of Niue that might be similar to that visible to anyone who’s fortunate enough to visit this point by ship. #6: A drone’s eye view of Niue from 18.9839°S 169.9375°W, at ~50 m above the ocean. The confluence point is about 7 km farther away than this, but a shipboard view from the point might be similar. #7: Niue’s capital ‘city’ of Alofi, just a few km away.